Landers Chrysler Dodge Jeep Ram of Norman, Oklahoma, has a great selection of Ram 3500s available! The most heavy-duty and hard-hitting of the entire Ram truck lineup, the 2019 Ram 3500 can handle just about anything you send its way. Available in multiple trims to fit every rugged lifestyle imaginable, you’ll be able to haul and tow in the all-new Ram 3500 to your heart’s content. From its spacious cabin to the oversized truck that’s bed is optimized for a variety of tasks, the 2019 Ram 3500 is one of the most capable trucks available on the market today. Let’s take an in-depth look at this durable and sturdy new pickup truck from Ram. Performance: Designed with the hardest workers in mind, the all-new Ram 3500 features several powertrain options suitable for each and every lifestyle. Standard in the 2019 Ram 3500 comes the Heavy-Duty 6.4L HEMI V-8 engine that delivers a best-in-class horsepower of 410, max torque of 429 pound-feet, and a max towing capacity of over 16,000 pounds with a max payload of 7,350 pounds. If you’re looking for epic performance in your new Ram 3500, opt for the Proven and Legendary 6.7L Cummins Turbo Diesel I6 engine that generates a max horsepower of 385, max torque of 930 pound-feet, and a max towing capacity of over 31,000 pounds with a max payload of 6,720 pounds for ultimate Ram performance. At the end of the day, either option is an excellent one–the decision is entirely up to you! Design: Aside from its insanely impressive performance, the all-new Ram 3500 has a bold and hyper-functional design that stands out in a crowd. For starters, available LED bed lighting allows you to work in darkness while still having visibility in the rear of the 3500. 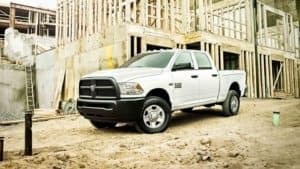 Box rail caps help protect your new Ram 3500 from scrapes and bumps that may occur when moving stuff in and out of the truck. Choose to receive the optional tonneau cover and the 2019 Ram 3500 instantly becomes more aerodynamic (in both style and function) while also providing coverage to items being transported underneath it. If you plan on doing some heavy-duty hauling, the available Max Tow Package includes a Mopar 30k fifth wheel hitch, the fifth wheel prep package, and air suspension to support all of that Best-in-Class fifth-wheel towing! The newest Ram 3500 also features the innovative Rambox Cargo Management System — a durable, secure, drainable, lit storage system fully-incorporated into the side rails of the 3500 to give you maximum storage and efficiency at all times. Technology: Who said trucks can’t be techy? The 2019 Ram 3500 comes fully-equipped with the coolest, most innovative automotive technology to keep you connected no matter where you go. Featuring the Largest-in-Class 8.4” color touchscreen and the onboard Uconnect system, the new Ram 3500 brings infotainment to your fingertips, front and center. Android Auto and Apple CarPlay also allow access to phone calls, messages, music, navigation and more — all wirelessly and straight through the 3500’s sound system. And, with an optional 4G LTE hotspot, your data plan stays intact while anyone can surf the web hassle-free, even when driving down the road. Does the 2019 Ram 3500 sound like the truck for you? 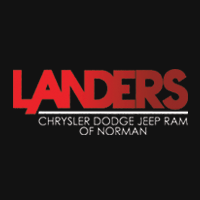 Visit Landers Chrysler Dodge Jeep Ram of Norman today to try one out–just click here!